(7 photos of a 1968 Gulfstream Aqua Blue Mustang GT California Special Hardtop) Gulfstream Aqua 1968 Mustang GT/CS California Special hardtop owned by Arlie Moses and now Shane Mills. This was our featured Attitude Of The Week photo for 6-15-08. Options include the C-code 289ci V8 engine, C4 transmission, 3.00 open rear, air conditioning, power steering, and power disc brakes. (10 photos of a 1968 Gulfstream Aqua Blue Mustang Fastback) Gulfstream Aqua 1968 Mustang Cobra Jet with the GT package and "R" code 335hp(428ci) V8 engine. It is owned by Rick and Kim in Alabama. The "R" code is in the VIN number, see engine data. This car was also the "Attitude of the Week" for 9/9/07, see the photo used. When we posted this car in late 2007 it was in Missouri. Rick and Kim tell us, "We recently purchased this beautiful Mustang (in February 2012) and are looking for any available history about the vehicle. Your site says the owner in '07 was in Missouri. We know the Mustang was near London, Ontario (Canada) in December 2010, and then was sold to us from Alabama. Where was the car before 2007, and where was it between 2007 and 2011? By the way, this beautiful Mustang needed a lot of work to get it both safe enough to drive, and running well. Nevertheless, it's definitely the real deal and we absolutely love it, despite the extra costs incurred since our purchase. Oh -- and it's NOT for sale! Lol"
(5 photos of a 1968 Sunlit Gold Mustang T-5 Convertible) This amazing 1968 Sunlit Gold T-5 Mustang comes to us from Mario Sikorski of Ingolstadt, Germany, and was our featured Attitude Of The Week for December 7th, 2008. Mario tells us that his T-5 has been restored, has all its matching factory numbers, and according to the Marti report this is a one of a kind. When these cars were exported to Germany, Ford could not register the "Mustang" name for sale. Ford replaced the "Mustang" emblems with "T-5" emblems. T-5 Mustangs exist from 1964 through 1979. (15 photos of a 1968 Candy Apple Red Mustang GT California Special Hardtop) Candy Apple Red Mustang GT/CS with 230 hp (302 cubic inch) 4 barrel, V8 engine. The CS stands for California Special which included a Shelby style decklid with a spoiler, sequential taillights, and a blacked-out grille with out Mustang identification. The GT was also missing from the normal GT wheelcovers. A similar option package was available in Colorado called the High Country Special. (4 photos of a 1968 Spanish Gold (Black Hills Gold) Mustang Rainbow Of Colors Hardtop) This amazing 1968 white vinyl top Mustang owned by Mal Hillier of Melbourne, Australia, has all the codes and special order color to be a Spanish Gold 1968 Rainbow of Colors West Coast promotional Mustang and was our Attitude of the Week for April 26th, 2009. It was built in San Jose, ordered in Los Angeles, under a special order with special paint WT3822. Mal writes: My Mustang was imported in to Australia from Los Angeles as a running car and I purchased it from an importer. I knew little about Mustangs and the hobby grew from there. The body and Paint have been refurbished and the color has been professionally matched to the original color in the trunk. Body was rust free fortunately. The Mustang was in very good original condition when purchased and I drove it home, I have done most of the mechanicals and put it all together my self, I also have the original owners manual and is a matching numbers car. But most of all, I love driving it. Spanish Gold shares the same paint code as Black Hills Gold used in January 1968 for the Color of the Month Mustang promotion. The Color of the Month promotion offered a special ordered color and sport options for each of the first 4 months of 1968. Black Hills Gold was offered in January for the New Years; Passionate Pink in February for Valentines day; Emerald Green in March for Saint Patrick's Day, and Eastertime Coral for April. Follow this link to see all Color of the Month promotional Mustangs on this site. (12 photos of a 1968 Brittany Blue Mustang Convertible) Brittany Blue 1968 Mustang convertible, left front view. This one has some GT options such as the reflective side C stripe and GT style wheels. (5 photos of a 1968 Royal Maroon Mustang Sprint Hardtop) This is a Royal Maroon 1968 Mustang Sprint with a 195 hp (at 4600 rpm), 289 cubic inch, 2 barrel, V8. The Sprint options packages started midway through the 1966 model year when Ford introduced the Millionth Mustang Sale featuring the limited-edition "Sprint" package which had a lot more chrome and a different engine due to engine availability problems in 1966. The Sprint option remained in later years with just the additional chrome and paint options which gave the car a GT look without the price. The 1968 Mustang Sprint option consisted of GT stripes, pop-open gas cap and the full wheel covers of six cylinder Mustangs. V-8s got in addition, the styled steel wheels with Wide Oval Tires and the GT fog lamps. (5 photos of a 1968 Meadowlark Yellow Mustang Hardtop) Meadowlark Yellow 1968 Mustang with 195 hp (at 4600 rpm), 289 cubic inch, 2 barrel, V8 engine. This car has Magnum 500 wheels. (13 photos of a 1968 Olive Green Mustang Rainbow Of Colors Branded Hardtop) mustang This double unique, special model, Mustang was our featured Attitude of the Week for the week of December 13th, 2009. Robbie Tromp from the Netherlands has restored this Olive Green 1968 Rainbow of Colors promotional Mustang which is also a Branded Special. This olive green is one of 13 special colors which a new Mustang owner could order along with several upgrades in the west coast Rainbow of Colors promotion. Also during this time dealers could add a Branded Special emblem to further promote a car. Amazingly this car is both! This was the first Olive Green Rainbow of Colors promotional Mustang that found us. A few months ago, Wolfgang Kohrn of ponysite.de, contacted us about finding a unique originally painted, olive green, 1968, Mustang in the Netherlands which had all the options and special order data to indicate that it was the first car found of this unique color. This is that car which is also featured on Wolfgang's site. So far we've only found 9 names of the 13 colors of the promotion. This green was not one of them, so we've been temporarily calling it Olive Green. If you know the official color name, let us know. About the same time, Jeff from Oregon, emailed us on his newest purchase of an olive green 1968 Mustang which turns out to be a sister car to Robbie's because the share the same DSO order area, special order number, and therefore ordered by the same dealer which was, Lou Gerard Motors, in Redding, California. Look at the other photos of this car, Robbie has much more information. (7 photos of a 1968 Presidential Blue Mustang GT Convertible) Presidential Blue 1968 Mustang GT convertible owned by Darryl from Alberta, Canada. This beauty was our featured Attitude Of The Week for the week starting February 28, 2010. Options include the Interior Decor Group, 8-track tape player, and center console. 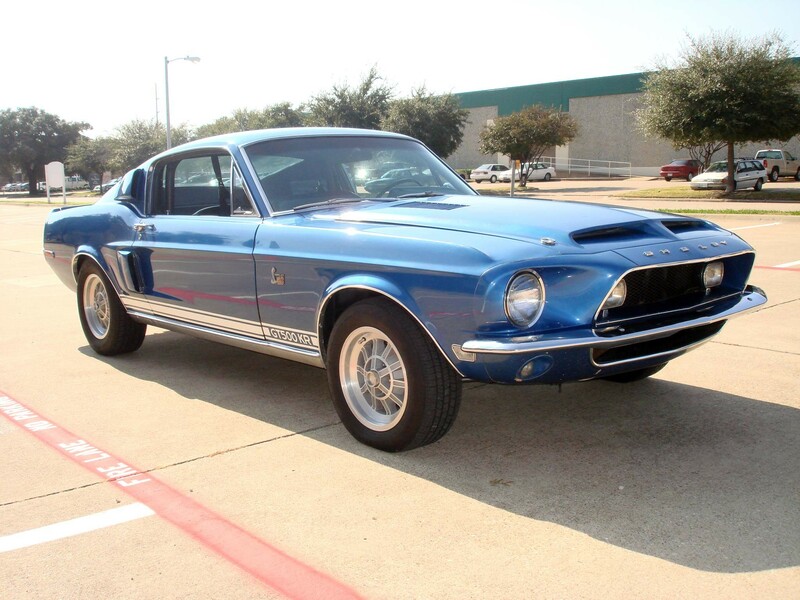 (15 photos of a 1968 Medium Blue Mustang Shelby GT-500KR Fastback) Medium Blue 1968 Mustang Shelby GT-500KR fastback in its original paint and a restored 400hp, 428ci, 4 barrel, Ram Air, Cobra Jet, V8 engine. The GT-500 King of the Road was introduced midyear and used Mustang's Cobra Jet engine but modified by Shelby to put out 65 more horse power. This photo is available in two wallpaper sizes; 1024-768 wallpaper and 2048-1536 wallpaper. (5 photos of a 1968 Lime Gold Green Mustang Sprint Hardtop) Lime Gold 1968 Mustang Sprint vinyl roof hardtop with wheel covers, metal rocker panel trim, chrome wheel lip trim, and an engine upgrade to the c-code, 195hp (at 4600rpm), 289 cubic inch, 2 barrel V8 engine. The Sprint option was was an economically priced upgrade which was aimed at reducing the risk of running out of the base engine by offering an engine upgrade and many of the GT options. This car has the 6-cylinder engine and is therefore known as the 1968 Sprint "A" Package. The door tag on this car reads 65CI6A05D712W: 65C 2-door hardtop, I Lime Gold metallic exterior paint, 6A black bucket seats, 05D assembled on the 5th of April, 71 ordered in the Los Angeles area, 2 2.79:1 rear axle ratio, and 2 automatic C4 transmission. (8 photos of a 1968 Acapulco Blue Mustang GT Fastback) Restored Acapulco Blue 1968 Mustang GT fastback with a deluxe (luxury) interior and a 325hp (at 4800rpm), 390 cubic inch, 4 barrel, V8 engine. (7 photos of a 1968 Dark Green Mustang Shelby GT-500KR Fastback) Dark Green 1968 Mustang Shelby GT-500KR fastback with a 400hp, 428ci, 4 barrel, Cobra Jet V8 engine. Dark Green was the Shelby name for Highland Green paint offered on the normal 1968 Mustang. The 1968 Shelby has custom front fascia, vented hood, side scoops, and rear quarter panel scoops. These came stock with the roll bar. (7 photos of a 1968 Lime Green Mustang Shelby GT-500 Fastback) Lime Gold metallic (or Lime Green metallic) 1968 Shelby GT500 Mustang fastback with a 335hp (at 5200rpm), 428 cubic inch, 4 barrel, Cobra Jet V8 engine. Options on this car include: power steering, power brakes, extra cooling package, heavy duty battery, a 3.50 rear axle gear ratio, tilt-away steering wheel, sport deck rear seat, and decor options group. (10 photos of a 1968 Seafoam Green Mustang Hardtop) Seafoam Green 1968 Mustang hardtop with wheel lip molding, metal rocker panels, pin striping, argent styled steel wheels, and a 289 cubic inch V8 engine modified with a 4 barrel carburetor. (16 photos of a 1968 Sunlit Gold Mustang Hardtop) Sunlit Gold 1968 Mustang black vinyl hardtop with vented hood, metal rocker panels, American Racing aftermarket wheels, and a non-original 302 cubic inch V8 engine.